About a month and a half ago, I uprooted from Salt Lake City and moved to Seattle. I was chasing a job, a new lifestyle, and the education of my partner. After leaving the Mountain West for the first time, there are of course things I miss. But when I think back to my time in the region, it’s not the Wasatch, the sunny weather, or the open spaces that come to mind. There’s a mural of the Virgin Mary on the side of a building in Salt Lake, around 200 S. and 200 E. The building holds Este, a New York-mimicking pizzeria with its name spelled in subway-style lettering, and a clothing store, the name of which I can’t recall. The mural depicts the madonna with an exposed, burning sacred heart. Surrounding the mural are the words of the omnipresent Catholic prayer “Hail Mary” in Latin. The building next to it is Gallenson’s, a local gun store. I used to ride up 2nd South on my bike on the way up to the University of Utah, but I never noticed the store. The day I finally did notice the madonna’s neighbor was the day of the Sandy Hook Elementary shooting. To my knowledge, I’m the only person out there who thinks of the Virgin Mary mural when I think of Salt Lake. The town is known for so many other things. It’s a boon for skiers, the Mormon Mecca, a new-age business haven, and a gateway to one of the most geographically diverse areas in the country. I reveled in Salt Lake’s other assets, but the mural continues to dominate my memory. I was raised Catholic, but no longer practice. A madonna isn’t something that catches my eye. In many ways, Salt Lake is the epitome of a city that is growing up. It’s passed its adolescent growth spurt (well, maybe — the greater Salt Lake area should more than double in population by 2050) characterized by suburban growth that stretched geographic limits. Hike in the Wasatch, and you’ll see suburban and industrial development stretch from the Oquirrh mountains in the west to the foothills of the Wasatch in the east. … now, and at the hour of our death. Amen. But the city realizes that kind of growth is what you do when you’re a teenager in urban development years, which most Western U.S. cities are. City officials now realize Salt Lake needs to be walkable, bikeable, and pedestrian-friendly. People don’t want to live a 30-minute drive from bars and dining. They want to live a stroll away from it, or above it. So why the mural, the madonna? America is a nation built on diversity. Few of its residents are natives, and the overwhelming majority of cities and geographic features are named not after natives, but the first white immigrants to “discover” them. It’s easy to argue whether this is good or bad — Congress is currently doing so — but it’s impossible to deny that for an American city to be truly great, it has to embrace diversity. Take a look at food in America, for example. Few things are as reliable a gatekeeper to culture as food, and the food of American regions is predicated by the immigrants (read: diverse individuals) that settled the areas. Wisconsin has German and Eastern European food. New York City has plenty of Italian to go around. Hispanic food is prevalent in Los Angeles, and the New Orleans gumbo you love so much comes from Acadian French who moved down and started the Cajun culture. America doesn’t — shouldn’t — have a singular identity. Despite what you may hear from Washington, the nation was built by immigrants, and the only way it can stay true to its character is to foster multiple cultures under an identifying umbrella in dynamic urban centers. When I see Salt Lake’s madonna, I see a visceral Catholic mural embedded in the downtown of a city built around the Mormon temple. That’s a sign of a city maturing. That’s a sign of what American cities should be. I’m anxious to watch Salt Lake mature, but as I said, I left. I now live next to, I argue, one of America’s crown jewels. Seattle is dense, vibrant in many ways (socially, musically, culinary), and progressive in its views on the relationship between the urban and organic environment. It’s what many Western cites should aspire to be. 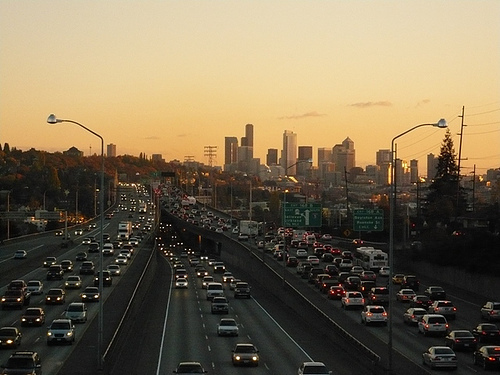 This kind of traffic happens pretty much daily in Seattle. forces, not human design, meaning most live well outside the city center in quasi-suburbs. These neighborhoods have developed into dynamic, self-identifying areas, but most Seattleites still don’t live where they work. The result: choking traffic exasperated by poor road infrastructure and short-sighted transit systems. I myself commute 25 miles one way to my job in Tacoma. My partner takes over an hour of her time in the morning to get to class in Seattle’s University District. It’s issues like this that interest me in Western cities, and the reason I’m writing this post. For the foreseeable future, I’ll be returning to this blog to chronicle, analyze, and maybe whine a little bit about what I see in Seattle. I’ve lived in Wyoming, Salt Lake, Manhattan, and now King County, giving me a wide-ranging view on how communities function. So that’s what I’m going to look at. Every week (hopefully), I’ll tell you what I find in Seattle, what I discover in the mountains and ocean outside the city, and about the people I meet in the process. What I look for are signs of progress, signs that cities are coming to grips with what their roles are and how they want to identify themselves. Progress can mean standing pat — preserving a historical building, for instance — or accelerating change necessary to mold cities into the societal hubs they should be. More simply, I’m looking for madonnas. One trip to Northern Saskatchewan and this is what happens. I’ll never forget asking you if you can believe that you’re up here and your reply, “Pam, I never thought I’d leave my county” Well you’re definitely out of your county and I’m looking forward to hearing more about your new life!